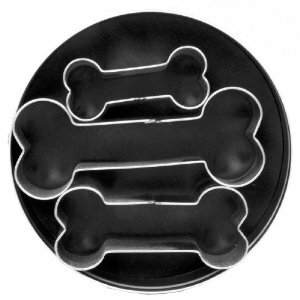 In honor of yesterday's inaugural Pet Month post about homemade doggie peanut butter biscuits, I am giving away two sets of bone-shaped cookie cutters. These are perfect for make treats for dogs of any size! Each set comes with three different-sized bones. This contest is open to US mailing addresses only. This giveaway will close on Saturday, March 10th at 11:59 pm et and a two winners will be announced on Sunday, March 11th. Tomorrow, cat lovers stay tuned for a guest blog post from Jerri at Simply Sweet Home! Oh my gosh how cute! Where did you get those?????? These would be perfect for our dogs- our smaller dog has to be on a grain-free diet so I sometimes make him homemade treats since the grain-free treats are so expensive. I can think of some really creative ideas with these! Following you! Posted to Fb.